Green Acres science curriculum for Grades 5 and 6 gives students the opportunity to observe natural phenomena in various settings, speculate about why things are the way they are, learn to test their hypotheses and draw logical conclusions. They develop an excitement for further research and learn to think scientifically about their world. 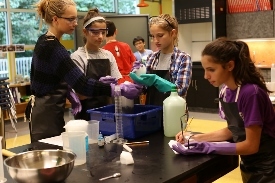 With their increased appetite for specific science topics, students in Grades 7 and 8 focus on more sophisticated concepts in biology, chemistry, and physics. In chemistry, for example, students speculate on how the periodic chart originated, before conducting their own experiments on individual elements. Because students learn best when directly engaged, Middle School science students use the woodlands, stream, gardens, and fields of our campus to observe a wide range of scientific principles, discover patterns and cycles, chart growth and change, and determine cause and effect. Four-day outdoor education trips to places such as Echo Hill Outdoor School, and Chincoteague, Virginia, supplement on-campus learning. Through the study of physical, chemical, and biological sciences, Middle School students begin to see the interdependence of plants, animals (including humans), and environments.